Objectives Failure to recruit sufficient applicants to general practice (GP) training has been a problem both nationally and internationally for many years and undermining of GP is one possible contributing factor. The aim of our study was to ascertain what comments, both negative and positive, are being made in UK clinical settings to GP trainees about GP and to further explore these comments and their influence on career choice. Methodology We conducted a mixed methods study. We surveyed all foundation doctors and GP trainees within one region of Health Education England regarding any comments they experienced relating to a career in GP. We also conducted six focus groups with early GP trainees to discuss any comments that they experienced and whether these comments had any influence on their or others career choice. Results Positive comments reported by trainees centred around the concept that choosing GP is a positive, family-focused choice which facilities a good work–life balance. Workload was the most common negative comment, alongside the notion of being ‘just a GP’; the belief that GP is boring, a waste of training and a second-class career choice. The reasons for and origin of the comments are multifactorial in nature. Thematic analysis of the focus groups identified key factors such as previous exposure to and experience of GP, family members who were GPs, GP role models, demographics of the clinician and referral behaviour. Trainees perceived that negative comments may be discouraging others from choosing GP as a career. Conclusion Our study demonstrates that negative comments towards GP as a career do exist within clinical settings and are having a potential impact on poor recruitment rates to GP training. We have identified areas in which further negative comments could be prevented by changing perceptions of GP as a career. Additional time spent in GP as undergraduates and postgraduates, and positive GP role models, could particularly benefit recruitment. We recommend that undermining of GP as a career choice be approached with a zero-tolerance policy. Qualitative and quantitative data from both focus groups and end of year survey data. Responses gained from trainees in Foundation year two and general practice (GP) specialty training. Surveys and focus groups all rely on retrospective narratives from junior doctors; therefore, time since an experience may reduce the reliability of this data. Focus groups of GP trainees at the start of their training and further research may be needed into how experiences change throughout training. No data gathered from the medical student population and further research needed in order to see whether denigration of GP is a problem in this group. Study of the denigration of GP in the UK has been limited to focusing on career intention9 14 17 18 and many questions remain unanswered.19 First, what comments, both negative or indeed positive, are being made by clinicians about GP as a career choice? Second, why are comments being made, that is, what are the factors underlying these comments? And third, how do the comments influence the eventual career choice of potential GPs? Thus, the aim of our study was to ascertain what comments, both negative and positive, are being made in clinical settings to trainees about GP and to explore these comments and their perceived influence on career choice with trainees who have chosen a career in GP. To our knowledge, no studies previously have sought to address these aims using qualitative and quantitative methods, in the UK or indeed internationally. FDs: So far in your foundation training have you received any specific comments, either positive or negative, regarding GP as a career option? If so, please describe the exact nature of the comments and by whom they were made. This was asked within the annual, regional FD survey in mid-2016 towards the end of their Foundation year 1 or 2. GPSTs: In this post have you had any specific comments made, either positive or negative, about your choice of career to be a GP? Please provide the exact nature of the comments and by whom they were made. This was asked within their End of Post Feedback Survey in July 2016 (following completion of a 6-month GP or Hospital Training Post). Comments were reviewed by the research team and classified as negative, positive or mixed. Where classification was unclear or ambiguous, the comments were classified as mixed. A descriptive analysis was undertaken grouping the themes depending on their nature and source, and the number and proportion of comments were presented. We undertook six focus groups with GPSTs from the two largest GP training programmes in one HEE region. Focus group interviews were conducted by members of the research team using a semistructured interview format to allow participants to elaborate on their experiences. Focus group interviews varied in size from 3 to 14 participants with an average size of eight (total number of participants=49). Each interview lasted approximately 40 minutes and was digitally recorded and professionally transcribed verbatim. Two researchers checked the transcripts in order to confirm the accuracy of transcriptions and to ensure that sufficient participant discussion had taken place, with minimal input from the researcher, allowing rich, authentic data to be captured. Participants were asked to describe and recall any comments made to them by primary or secondary care clinicians, at any point in their training, regarding a career choice of GP. They were asked to expand on the comments and discuss similar or contrasting experiences, and whether they felt that the comments had affected their career choice in any way. Thematic analysis, based on the model outlined by Braun and Clarke,23 was carried out by two members of the research team using a mixed deductive and inductive approach. Participants were fully consented and approval was granted by the University Faculty ethical board. There were 780 responses to the survey from 839 FDs (response rate=93%). Two hundred and thirty-two (30%) FDs reported having received comments about GP as a career choice. Ninety-one FDs reported positive comments (12% of responders), 50 reported negative comments (6%) and 56 reported both positive and negative comments (7%). There were 343 responses to the GPST end of post evaluation from 399 trainees (response rate=86%). One hundred and thirty-eight (40%) GPSTs reported comments during their previous 6 months post. One hundred and fifteen trainees reported positive comments (33% of responders), 15 reported negative comments (4%) and 8 reported both positive and negative comments (2%). Table 1 displays the types of comments reported by FD and GPST doctors. The most common types of positive comment were the generic statement ‘you would make a good GP’ (predominantly made to GPSTs; GPSTs perceived this as a positive comment, but it could be argued that this is not necessarily the case), work–life balance issues, the view that the GP training programme was good (predominantly made to FDs) and the variety of the job. Workload was the most common negative comment made to FDs. Other comments were related to it being a wasted career, an easy choice, boring and stressful. Positive and negative comments were also grouped by the role of the commentator (table 2). The majority of positive comments were made by GPSTs, followed by GPs. In contrast, the majority of negative comments were made by hospital clinicians. Thematic analysis of the data revealed details of the comments being made and their influencing factors, and a model of how they affect trainees emerged (figure 1). Factors influencing clinicians’ perceptions of general practice (GP). NHS, National Health Service. A picture of the spectrum of clinicians’ perceptions of GP, varying from multispecialists to ‘just a GP’, emerged. Within the hospital setting, particularly in the acute specialities, the job of a GP was viewed as very simple: GPs were perceived as not using or possessing particular skills that hospital doctors had. "GP’s just being very simple, managing very simple things and you’re not going to be using your brain that much, you’re not going to be using your clinical skills that much it’s just talking and talking". (Senior Registrar being quoted). "you’re too good for GP’ - like that was kind of what he was getting at"
"because you are the main community doctor so you are going to deal with so many different things and so you hold a lot of responsibility"
A number of key factors emerged that appear to underlie clinicians’ perceptions of GP (see figure 1). Some factors were predominantly linked to positive perceptions (previous exposure and experience of GP, family members who were GPs, GP role models), some were linked to both positive and negative perceptions (age and specialty of clinician) and others to predominantly negative perceptions (lone working, uncertain future, referral behaviour). "I think everyone should do a foundation rotation in GP, everybody. I think it will help not only people decide if they like it and what to do. But also () having consultants () understand what GPs actually do"
"it’s the people who have of no experience of it, you know personally, or links to it that then give the negative"
"And asking for a reference from a consultant whose wife is a GP for GP training, ‘ah yes I’d be delighted to give you a reference, it’s excellent that you’re going to do GP’; But I think that’s coming from his understanding of what it involves"
"So I think role models is what changes perception, we need people to stand up and help change things"
"working in A&E (Accident and Emergency department) I’ve had the whole ‘you’re wasted in GP' "
"I think it’s that old school kind of consultants who would never have done a GP job in the foundation program training who therefore think things aren’t as they are"
"that for a sociable person GP is a lonely job and people would say that as a negative thing"
"anyway my consultant was trying to discourage me from getting onto the GP programme, saying that, it might be appealing now but he doesn’t think that things will remain as such in the future"
A further theme that emerged consistently across all focus groups was the relationship between referral behaviour and perceptions of GP and GPs. Participants described numerous experiences of hearing consultants, junior doctors and nurses criticising GPs for ‘rubbish’ referrals. GPs were criticised for failing to independently manage medical problems and were seen as frequently referring, mainly to make their own job a lot easier. "But in my foundation program I felt that, you know, you work in medical admissions so not even in A&E and it’s like well this is a rubbish referral from the GP, this GP is obviously crap"
" ’this is an inappropriate referral - GP’s are rubbish’: you get that almost I think in every job I’ve done as a hospital doctor and before that when I worked as a midwife or as a nurse"
"I always wanted to do GP in medical school but then when I got to F1 I sort of, you know fell out of love with it a little bit, I think part of that was because there’s so much GP bashing around F1s and in hospital"
"I think one of the reasons why I didn’t just apply for GP straight out was because the people, the medics that I was with were saying, well you’d be wasted you should be doing medicine … and they tipped me away from where I’ve actually ended up, if that makes sense"
Most participants felt that their colleagues who were undecided about GP training could potentially be dissuaded. "But I can imagine someone who is half and half with a constant barrage of these sort of tongue in cheek comments might you know change their mind"
Our study was explicitly focused on the influence of comments made by clinicians towards a career in GP but, not surprisingly given the multifaceted and complex nature of career choice, other potential influences on career choice emerged from the analysis. "Also everything in the press, not just now but over the last however many years, there is a lot in the press about GP’s and missing this missing that and misrepresentation and I think that as well does impact on people’s perception"
"I think that’s really difficult in medical school because you spend so little time in general practice or based in general practice … and that kind of just influences your choice as to whether you actually really want to be a GP or not"
"It is even at the beginning when they say ‘so who here wants to do this or whatever' and you’ve got a lecture of 300 and they say ‘so the study showed that 50% of you are going to be GP’s, how many of you are’ and like… ’hands up not very many' and they go ‘ha ha’ and it seems like a bit of a joke somehow"
Our study has demonstrated that both negative and positive comments are being made to trainees about a career in GP in the UK and a number of influencing factors have emerged. Many trainees reported positive comments and a significant minority of FDs (19%) and GPSTs (6%), reported negative comments. Qualitative analysis revealed a number of factors that appear to be underlying clinicians’ perceptions of GP (see figure 1): Previous exposure to and experience of GP, family members who were GPs, GP role models, age and specialty of clinician, lone working, the future of the NHS and the influence of referral behaviour. The predominance of positive comments is striking and the relative low proportion of trainees reporting negative comments is lower than might have been expected. It is important to note that the trainees are only reporting comments made in their previous placement for GPSTs (6 months) or during Foundation training for FDs (1 or 2 years); some would argue for a zero-tolerance attitude towards undermining, similar to any other form of discrimination.3 24 The larger proportion of negative comments reported by FDs is particularly concerning given that they ar￼e yet to commit to a specialty, whereas the increased proportion of positive comments to GPSTs may be understandable as these doctors have already chosen their career path. The nature of the positive comments is also of interest in this group, as half of the comments were praising the doctor that they would ‘make a good GP’, rather than praising the specialty. GPSTs perceived this as a positive comment, but it could be argued that this is not necessarily the case. No similar studies have been reported previously so we are unable to make comparisons, or to comment on whether a similar number of comments, negative or positive, are being made about other medical career choices. The majority of negative comments were made by hospital doctors; there were also negative comments from GPs, whereas GPSTs appear to be championing their specialty. We have proposed an original model (figure 1) to frame the relationship between the factors found to influence clinicians’ perceptions of GP, how this relates to the comments they make and the influence that these can potentially have on trainees’ career choice. 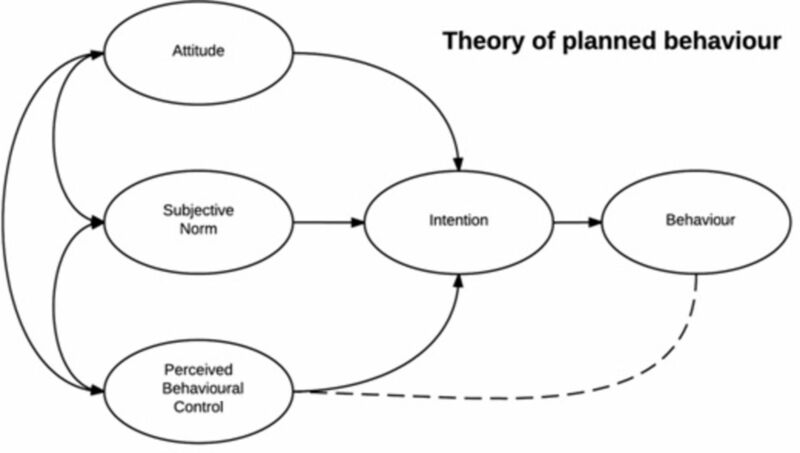 This model maps conceptually within the theory of planned behaviour (figure 2),33 a model used to frame a wide variety of behavioural intentions. Perceptions of GP appear to be key, combined with the impact of subjective norms within clinical contexts; both primary and secondary care settings. This behavioural model suggests that to tackle the problem of negative comments about GP as a career choice, we need to address both the factors that influence this perception of GP and the clinical contextual settings, while also addressing individuals’ beliefs that they can change their behaviour. The causative factors that our study suggests are influencing perceptions, and therefore comments, about GP may be interlinked: older consultants are suggested in the focus group study to be more likely to make negative comments suggesting that ‘tribalism’ within medicine may be less of a problem with the new generation who have had more exposure to GP as FDs or medical students. Acute specialties may generate more negative comments due to the link with referral behaviour: specialties in which their increased workload is perceived to be due to transfer of work from primary care appear more likely to make negative comments. In contrast, several factors centred around increased understanding of a GPs’ role, appear to make positive comments more likely: having a GP as a family member, GP role models and previous exposure to GP. These are all relatively original findings in the context of the influence they have on perceptions of and comments about, GP by clinicians in training settings. Similarly, the portrayal of GP as a lonely career and the uncertain future of the NHS appear to be influencing factors that are worth confirming and exploring further. Our multimethod study provides triangulation of our findings from two contrasting sources. The high response rate in the survey and relatively large number of participants in the focus group study supports the validity and trustworthiness of the findings. Although the results are from one region of the UK only, there is no theoretical reason why they would not be generalisable, certainly across England and probably the UK. There are some limitations of the study, one being participant recall. We would suggest that prospective studies be undertaken of comments made to medical students and/or trainees. Although the mixed method aids triangulation of our findings these are some differences between the survey and focus groups: For example, the survey questions asked trainees about comments made in their most recent placement only, due to being a component of the trainees postplacement evaluation, whereas the more open and explorative focus group discussions included comments heard throughout their undergraduate and postgraduate training. In addition, focus group participants were GPSTs and we were, therefore, not able to determine whether any potential applicants to GP training had truly been dissuaded due to negative comments. Our study corroborates anecdotal evidence of denigration of GP in clinical settings within the UK and suggests the need to work towards a ‘zero tolerance’ of undermining of career choice. It also reveals several underlying factors influencing the perception of GP and thus, the likelihood of clinicians making negative and positive comments about GP as a career choice. We would strongly recommend that further explorative work and quantitative surveys are undertaken to explore the extent to which our findings are confirmed nationally and internationally, and to confirm to what extent they are discouraging students and trainees from following a career in GP. We have hypothesised an original model, based on motivational theory, to explore the influence of comments made and would recommend that this model be tested in other clinical contexts to confirm and build on our findings. In addition, we would recommend that work be undertaken to explore undermining of hospital medicine by GPs and other clinicians. Badmouthing of all specialities, including GP, whether in the primary or secondary care setting, must be addressed and confronted as a discriminatory issue. Thanks to the Faculty of Medical Sciences at Newcastle University for funding the focus group study. Thanks to the Postgraduate Primary Care School and Foundation School at Health Education England (across the Northeast and North Cumbria) for collecting the questionnaire evaluation data, and for funding the GP specialty trainees undertaking an education attachment, to the Durham Tees Valley and Northumbria Training Programmes for facilitating access to the General Practice speciality trainees and the participating trainees for their time. Thanks also to Jo Hall for her early help in the project and to Alison Bonavia and Bob Mckinley for advice on drafts of the manuscript. General Practice National Recruitment Office. Recruitment figures 2015: general practice ST1, 2015. https://gprecruitment.hee.nhs.uk/Portals/8/Documents/Annual%20Reports/GP%20ST1%20Recruitment%20Figures%202015.pdf?ver=2015-12-18-140824-470 (accessed Apr 2017). NHS England. General practice forward view, 2016. https://www.england.nhs.uk/wp-content/uploads/2016/04/gpfv.pdf (accessed Apr 2017).
. By choice — not by chance: supporting medical students towards future careers in general practice. London: Health Education England and the Medical Schools Council, 2016. https://www.hee.nhs.uk/sites/default/files/documents/By%20choice%20not%20by%20chance%20web%20FINAL.pdf (accessed Apr 2017).
. ‘Bashing’ of medical specialties: students' experiences and recommendations. Fam Med 2008;40:400–6.
. Rejecting family practice: why medical students switch to other specialties. Fam Med 2000;32:320–5.
. Professional badmouthing: who does it and how common is it? Fam Med 2010;42:388–90.
. Becoming a GP-a qualitative study of the career interests of medical students. Aust Fam Physician 2005;34:204–6.
. Lincoln. Fourth generation evaluation: Sage, 1989.
. Social research methods: Oxford University Press, 2001.
. Thinking about research: frameworks, ethics and scholarship. Understanding medical education: evidence, theory and practice, 2010:283–300.
. GP recruitment and retention: a qualitative analysis of doctors' comments about training for and working in general practice. Occas Pap R Coll Gen Pract 2002;83:1–33. Royal College of General Practitioners. Patient safety implications of general practice workload, 2015. http://www.rcgp.org.uk/policy/rcgp-policy-areas/fatigue-in-general-practice.aspx (accessed apr 2017).
. From intentions to action: a theory of planned behavior. In: Kuhl J , Beckman J , eds. Action-control: from cognition to behavior. Heidelberg: Springer, 1985:11. Contributors The study proposal was proposed by HA and developed jointly by HA, KB, HC and KM. The focus groups were undertaken by HA and KM and analysed by HA and KM. The survey data were analysed by HC and KB. The paper was written by all authors jointly and all authors approved the final version of the paper. The guarantor for this paper is HA. Funding Funding for transcription, publication fees and the cost of focus groups was provided by the Faculty of Medical Sciences at Newcastle University. Ethics approval Ethics approval granted by Newcastle University Ethics approval committee. Ethics Approval application number: 00911/2015. Data sharing statement Additional unpublished data, quotes from focus groups and survey questions which have not been included in the paper, can be requested via the corresponding author.